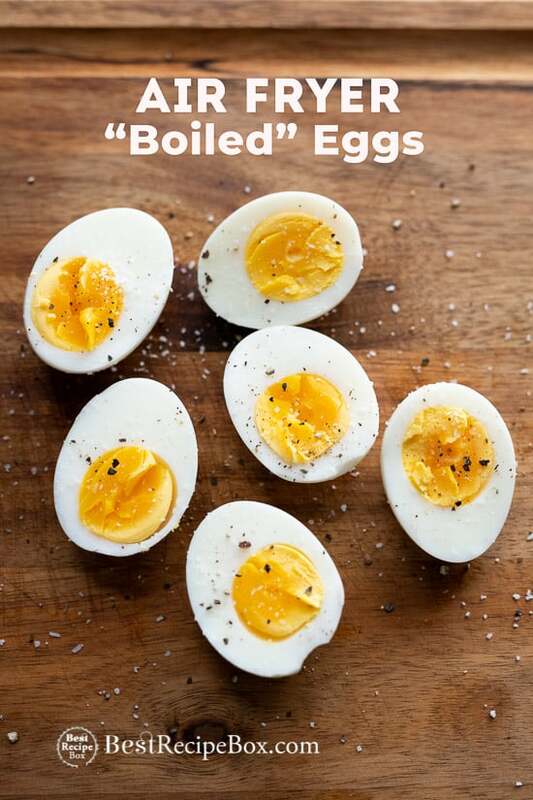 It’s hard to believe how easy it is to make hard boiled eggs in the air fryer. 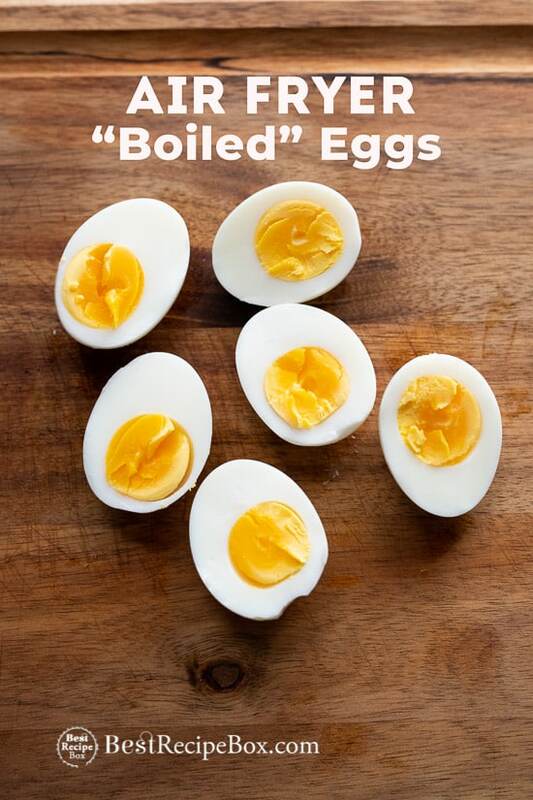 Seriously, it’s crazy to think how simple it is to make air fried boiled eggs. This concept is mind blowing but it works like a charm. 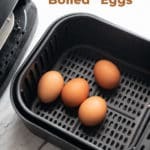 If you want to learn how to make boiled eggs in the air fryer, watch our video and our photos below. 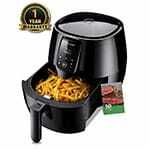 All air fryer temperatures vary slightly. We’ve tested 4 different air fryers at 270°F for 15 minutes. The yolk is perfectly set and not dry. If it’s your first time, don’t do a huge batch at once! Cook a test batch first of maybe 1-2 eggs. 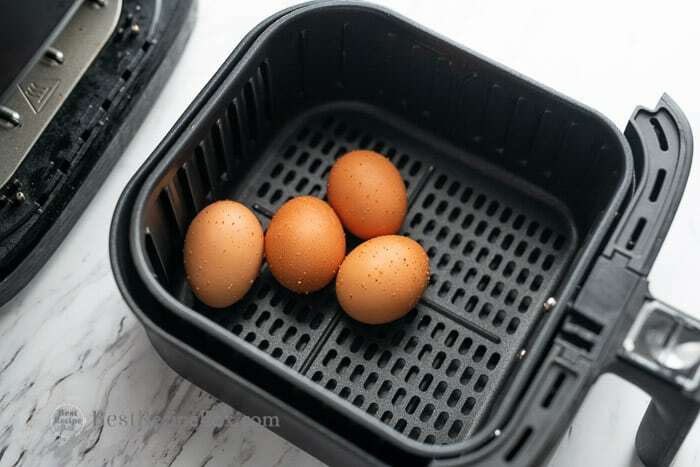 It’s trial and error at first and after that, you’ll know exactly what the best time and temp is in your air fryer model and the size of your eggs. We used cold eggs straight from the fridge and it worked fine. 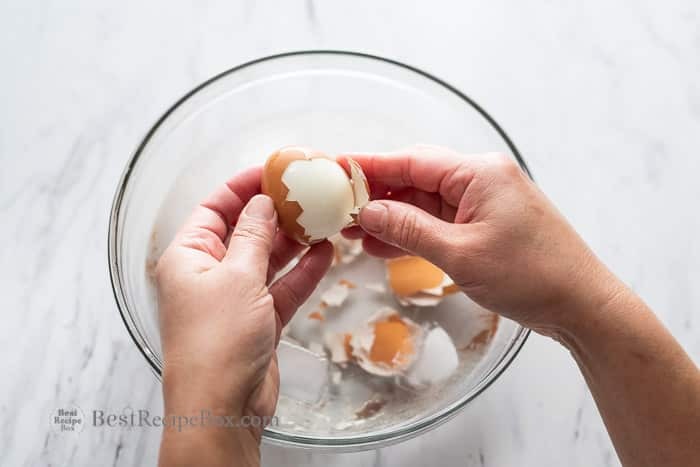 If you use cook a dozen eggs at a time, you might have to increase cooking time by maybe 2 minutes to make sure all the yolks are cooked through. This timing is for large eggs. If you’re using small, medium or jumbo eggs, adjust your time! Recipe details are below in the recipe box. 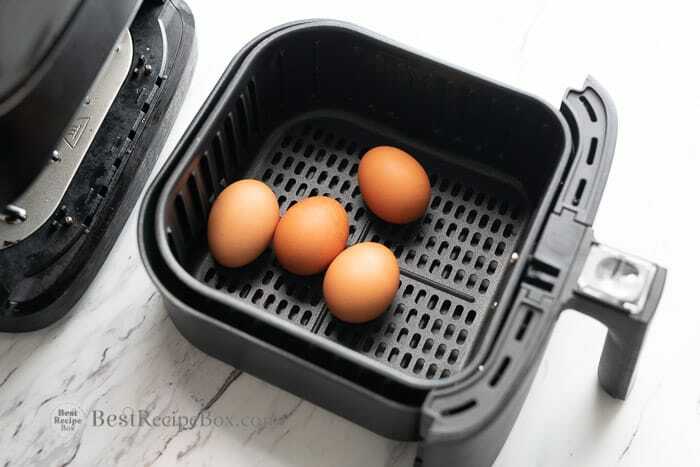 Carefully add raw eggs in the air fryer basket. After cooking in the air fryer, immediately add to a bowl of ice water. It’s so easy to peel. If shells stick a bit, just dip in the water or peel under the water. If it’s your first time, don’t do a huge batch at once! 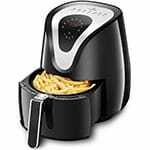 All air fryers, especially different sizes, cook slightly differently. Cook a test batch first of maybe 1-2 eggs. 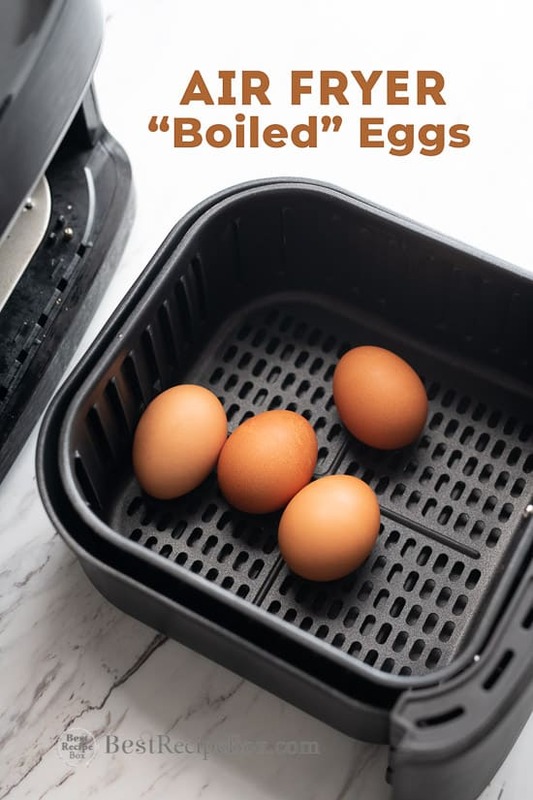 It’s trial and error at first and after that, you’ll know exactly what the best time and temp is in your air fryer model and the size of your eggs. This timing is for large eggs. If you’re using small, medium or jumbo eggs, adjust your time! Also, please read all our tips on the recipe write up page. Also, also, it’s easy to make a mistake and set the temperature too high! Make sure it’s at 270°F and NOT 370°F. Place eggs in basket. Air fry at 270°F for 15 minutes. Set your timer! While eggs are cooking, fill a bowl with ice water. 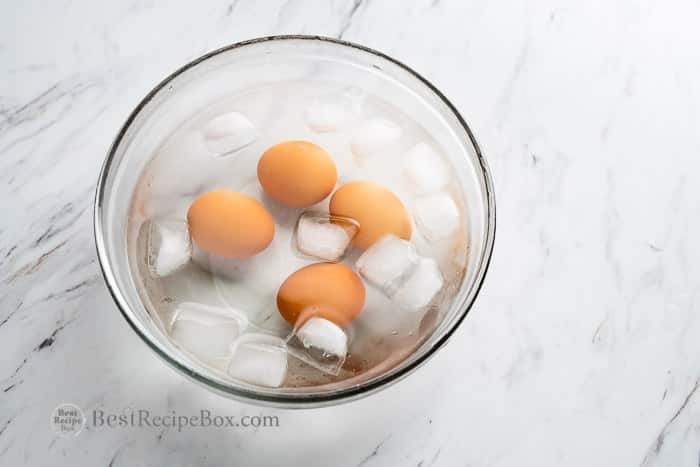 When eggs are finished, immediately place them in the ice bath for about 5 minutes. Peel the eggs. If it’s hard peeling, try peeling them under water. If you want your eggs more or less cooked, adjust your timing next time. Enjoy! 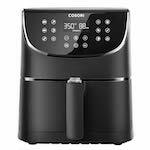 If cooking in multiple batches, the latter batches may cook quicker since the air fryer is now warmer then for the first batch. 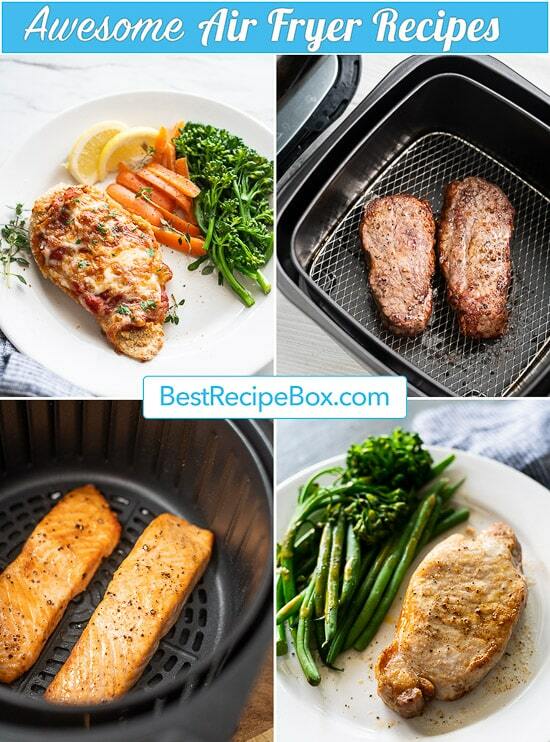 This recipe is written up with Air Fryer NOT preheated. If you preheat, use less time for the cooking. This is nuts! I love this little hack. 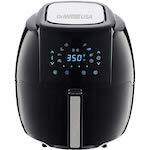 Can’t believe I can actually boil eggs in my air fryer. I’m usually really scared of boiling eggs with my little kids around. This is a much safer suggestion. Thanks a bunch!